To anyone who was listening to the financial media, especially on TV, there was no shortage of Market Correction Theory. Many felt vindicated by the mis-call of “Sell in May and Go Away” . . . that surely omen must be coming, just a little late. Heavens ! it’s the 11th of July and we’ve slipped back to the market values of June 30th (S&P 500 basis). Surely bad things are just around the corner. But are they? The chart above does show a break of the lower trend channel (solid purple line) but we’ve not broken the major support level at 4340 (NASDAQ Composite Index). 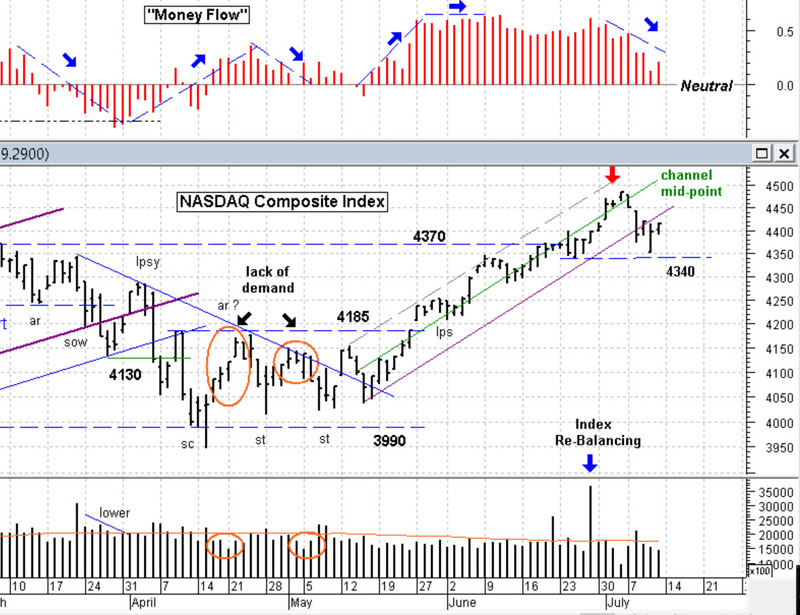 So while the channel break was a Sign of Weakness that is only 1 of the 3 selling signs that Wyckoff Theory holds. The other two are: a divergence of price volume and a failed upper swing (high). Price Volume Divergence: what I’d look for is supply (volume) coming in on weak bars (prices closing at / near the lows, especially with a wide spread. Failed Swing: we’re talking about a UTAD (Up Thrust After Distribution), where prices rise near the previous swing high on very light volume. That could happen, but we have not seen that yet. Be on the look out next week though. Let’s go back a moment and see if we can spot a Buying Climax (red arrow?). I don’t see it (note that big volume spike was index rebalancing, not supply coming in. No big move higher on big volume. So . . I’m skeptical that this “correction” is a real Distribution structure, at least not yet. On Tuesday my (separate) Market Sentiment indicators went “Neutral” showing the market was nervous, and my Price Strength indicators went “Less Bullish” on Thursday. But so far, only a Yellow flag of caution. 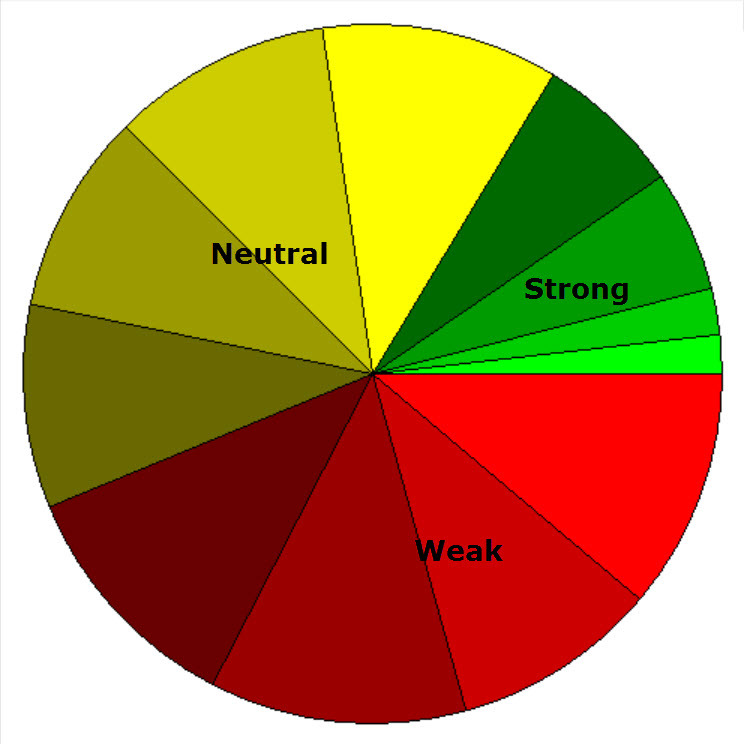 Price Strength pie chart (above) shows price weakness. There is a lot of Red and Yellow there. But are people actually selling or just not buying? 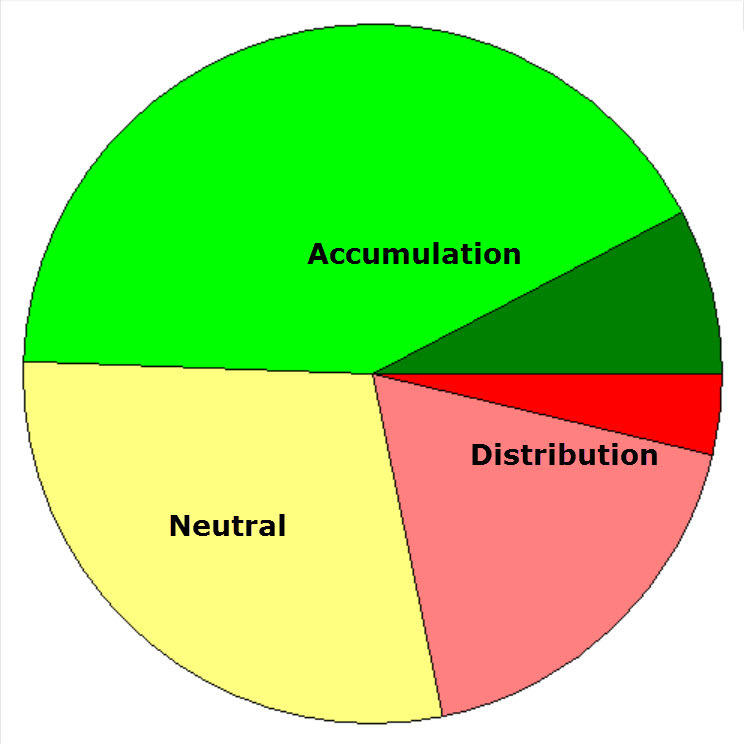 The Accumulation (buying) and Distribution (selling) pie chart above shows us that about half of the stocks in the S&P 1500 index are still in Accumulation. This (so far) confirms my Wyckoff interpretation that we’re not in a Distribution structure, at least not yet. OK, prices are weak and that’s fairly broad, but so far not excessive selling. Sounds like a “Shake Out” than an actual market correction (again, so far). No surprise that Miners are. Copper, Aluminum and Gold, Silver, Platinum are in demand. Industrial metals (strong economy) and precious (nervous investors). Some of my stops got hit this week and I reluctantly sold them (rules are rules). But that’s the problem with growth stocks, they go up fast and also come down fast. The Caution flag is flying, but let’s not over react until we see the two other Wyckoff Signs of a potential market turn. After all, this could be a buying opportunity as well. Let’s keep our powder dry (to use a well worn phrase). Have a good week. ………….. Tom ………………..
price chart courtesy of MetaStock; pie chart & table by http://www.HighGrowthInvestor.com; used with permission.